I lasted little more than a month without playing an online game. Tonight I signed up for the 30 day trial of Lord of the Rings Online. I didn’t want to do it at first because there is neither a “priest” or “wizard” class in the game – those are the roles I’m most inclined to play. I went with the minstrel class, because I can heal and buff up my fellows. Anyway, on my first hour or so of playing, guess what uber-geek “character” I ran into? Not much longer after that, I was asked if I was a “Real Girl.” Although the number of female gamers is on the rise, people on these online games have a hard time believing that real girls exist in lands where hobbits roam. I smudged the name to protect the poor soul. I’m probably old enough to be his mother, anyway. 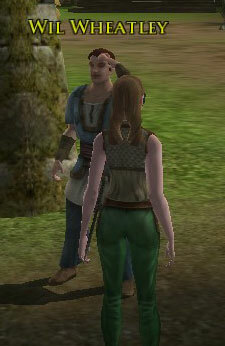 Anyway, if you’re on the Nimrodel server, give Dinahwyn the minstrel a holler!